Aloo Methi And French Beans recipe by Nazia Nazar at DesiRecipes.com. 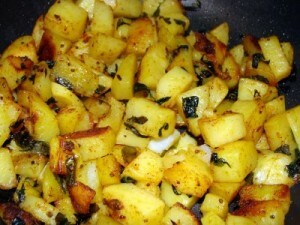 Heat oil fry methidana than add ginger , garlic salt , red chilly, haldi fry, add chopped potatoes, beans and fry well. Add 1 cup water and cover till done. Lastly add soaked dry methi and cover till done.